During the past 25 years, school Eco-Clubs have been hosting environmental fairs and participating in “green” activities. In Ontario, Stouffville’s Barbara Reid Public School and its eco-partners held the “Eco-Fair Building Nature Connection” last May. 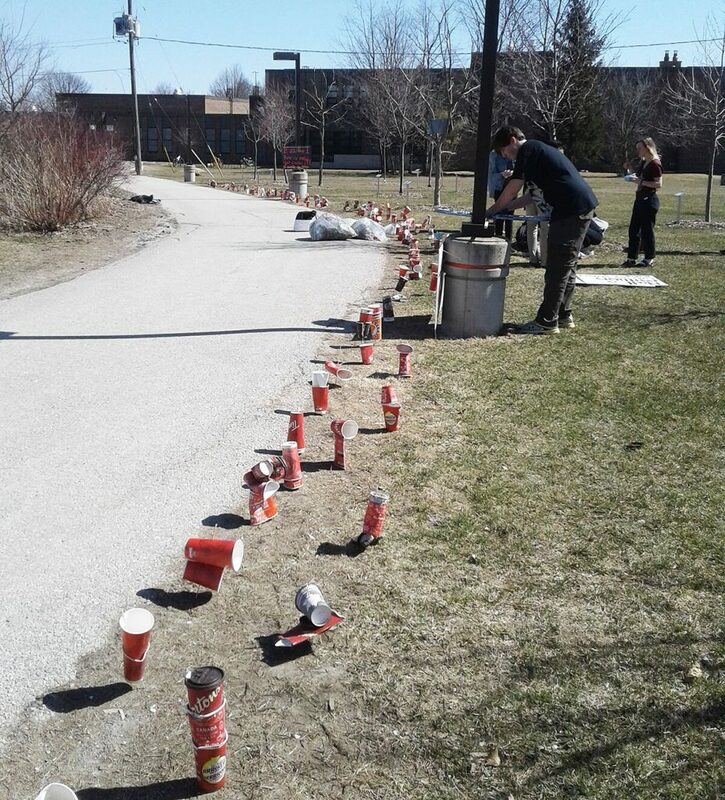 On a school pathway, Pickering’s Dunbarton High School students created artwork discouraging the use of disposable cups. Whatever an Eco-Club’s endeavours are, especially where animals, birds or mammals are involved, youth become engaged in solving environmental challenges. Photos by David Gordon, Dunbarton High School. During that same time period, it has been observed that sea turtles are eating twice as much plastic as once they did. The photograph of a turtle with a straw wedged up its nose went viral and inspired pledges to “Skip the Straw.” This single-use plastic can eventually puncture a sea mammal’s intestinal walls, destroy the digestive system and disrupt reproduction. The history of the straw began with ryegrass 150 years ago. Paper straws followed, and by the 1960s, the plastic straw made its way into our culture. Our addiction to its use provides classmates with a perfect anti-plastic platform for a campaign to end its popularity. Millions of straws in restaurants and those included in juice containers that enter school lunch rooms are discarded daily. Most are destined for landfill or are incinerated, others become the familiar litter in our streets and parks. When tossed near beaches and rivers, they are blown into the water. 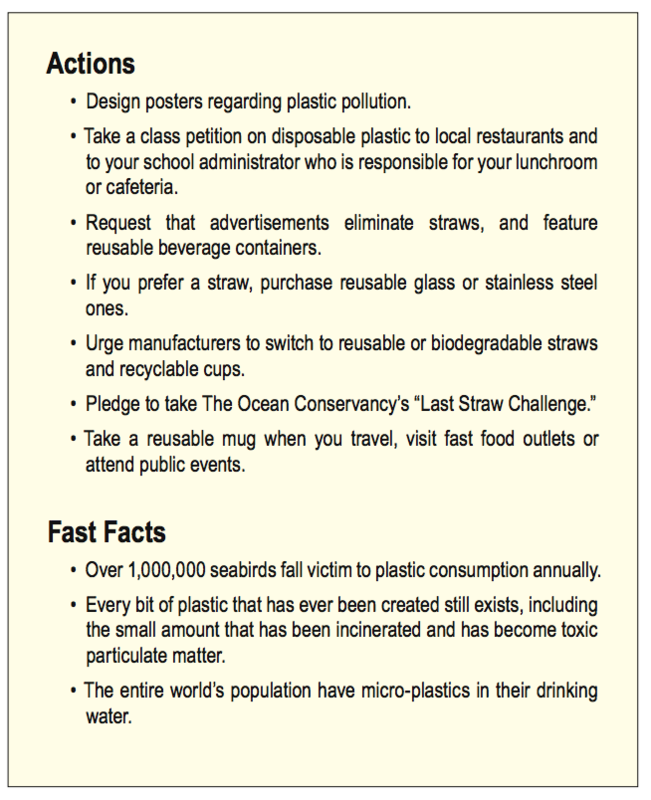 The Ocean Conservancy ranks straws in its top ten collected items. When you include them with the profusion of all the other forms of plastic that enter our waterways, we are facing the destruction of our planet’s life-giving oceans and lakes. 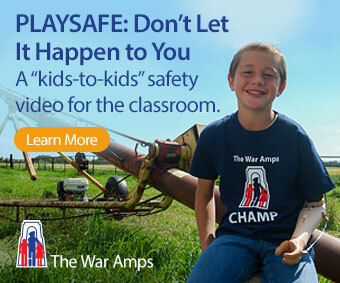 When students become engaged in environmental causes, positive results happen. In Calgary, elementary school students Mya Chau and Eve Helman launched a petition directed at Starbucks after their science project revealed the shocking statistics of discarded beverage cups. 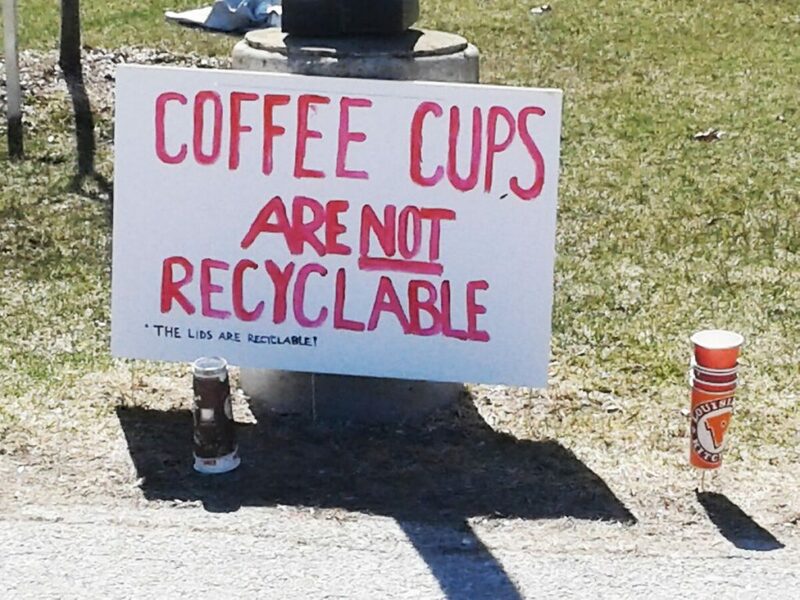 The girls stated, “In Canada alone, over 1.5 billion disposable coffee cups are thrown away each year. We urge Starbucks to lead the way towards a more sustainable future. We ask them to please develop a cup that can be recycled across North America and around the world.” They challenged Starbucks in particular, as the company had promised to create sustainable cups by 2015 but regrettably has not followed through. Mya and Eve’s survey of 167 people indicated, on average, 155 single-use cups per person are thrown in the trash annually. Their research found that, worldwide, 430 billion single-use disposable cups are discarded annually which translates to about 140,000 cups every second. Disposable cups, lined with a layer of polyethylene plastic, are impossible to recycle and a nuisance to compost. The girls’ efforts contributed greatly to this global campaign by receiving over 170,000 signatures asking Starbucks to lead by example. It also garnered the environmental support of environmental groups as well as several prominent individuals resulting in their presenting similar petitions alongside that of Mya and Eve at the Starbucks’ 2018 annual shareholders meeting held on March 21 in Seattle. In total, over 884,000 signatures were presented. Starbucks announced a $10 million initiative to develop recyclable, compostable cups over the next three years. The girls also spoke to Kevin Johnson and the Global Social Impact team about what further steps could be achieved, such as ensuring that people bring in their own reusable cups. This month Starbucks announced that it would be phasing out plastic straws. Royalty also walks in the company of students protecting the environment. Her Majesty, Queen Elizabeth II, the new Queen of Green, has officially declared war on plastic straws and bottles by eliminating them from the royal estate’s cafés, dining halls and catered events. Beyond the royal gates, several cities, corporations, tourist destinations, and small businesses have announced that they too will curb the use of single-use plastics. The success of these movements will not entirely solve the ocean crisis but they have become huge milestones toward changing habits. Teachers who assign an environmental class project—anything from art to zoology research—not only will help enforce political and corporate stewardship today through student action, but also will produce the environmental graduating professionals that we desperately need for our future.